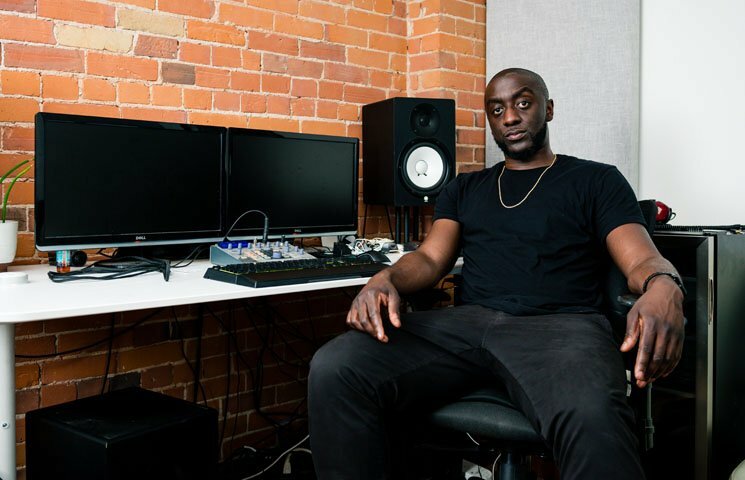 Quiet, humble and hard-working are all words that could describe 28-year-old, Toronto-raised, Brampton-based producer Prezident Jeff, but hungry, detailed and patient are the words that landed him a coveted spot creating the city's musical fabric. Though he has worked with the likes of Kevin Gates and Wiz Khalifa, and is best known for producing Roy Wood$'s hit single "Instinct," Prezident Jeff grew up in a household far removed from hip-hop culture. "We listened to a lot of gospel music and [Ghanaian] highlife music. I didn't really get exposed to hip-hop until grade 7/grade 8," he says. "Right when I got introduced to hip-hop, it was around the time that 50 Cent came on the scene, [who's] obviously synonymous with Dr. Dre. I was very interested in that instrumentation, those beats were so hard. Especially that G-Unit run from 2002 to 2006, I was just fascinated with that sound. I just wanted to figure out how Dre made those drums sound the way that he did." After getting his first copy of FL Studio at around 16 years old, Prezident Jeff started skipping school to create beats for his friends, most of whom were testing the rap waters themselves. "It was pretty innocent, I wasn't thinking of turning it into a career, [it] was just super fun to do," he says. A few years later, the then-22-year-old decided to dedicate his life to it. "My background is in the automotive field, where I was painting cars full time. I'd come home from work — I was married at the time too, so I had a family at home, and would kiss the wife and then go to the studio. Even though I had the job, I was still flat broke. Honestly, I was spending money that I didn't have and putting myself in a hole financially just to make it work, but I believed in it so I had to do what I had to do," he affirms. It would take another two years before the young producer landed a placement, which came in the form of "Wild Ride" on Louisianan rapper Kevin Gates' 2014 mixtape Luca Brasi 2. "At the time, I was just trekking along not really knowing what I was doing. I wasn't at the point where I was doubting myself, but I started producing in 2012 and by 2014, there weren't any big placements. When ["Wild Ride"] came, It was a turning point for me because it signified 'Yo, you can do this.'" Since his first placement, Prezident Jeff has matured as an artist, expanding on rhythmic sounds and layered melodies using FL Studio, but also Omnisphere, Analog Lab, gear from Native Instruments and a bundle of sounds from Output. He continues, saying he doesn't play instruments, but would rather refer to himself as a sample-based producer. "I'm not a pianist, but I can fool my way around the keyboard," he laughs. "It's very rare that I'll start out with the drum lines, as I find it to be super constrictive — 99.9 percent of the time it's melody [first]. The melody has to have some sort of bounce with it so it can lead me in a different direction so it can inspire me with the drums." Roy Wood$' aforementioned single "Instinct" is a result of just that — melody first and drums second, ultimately catching the attention of high-fashion brand Dior, and landing itself in a recent DiorSkin campaign. "We started out as this artist-producer relationship, but it's been cool from working together to actually being friends and sit back and watch his growth. That made that Dior campaign super special because we did that together," Prezident Jeff exclaims. "I can remember FaceTiming him while he was on [Drake's] 'Summer Sixteen' tour and sending him the beat, and him FaceTiming me an hour later like, 'Yo! This is crazy!' They sent the record back a day later. Just to think about me making that beat [here] at Diamond Factory Studio, seeing what it became and then Dior picking it up for one of their campaigns… it's crazy, it's all in the family." For Prezident Jeff, his time has been a long time coming — but strategic on his part, signing a publishing federal with Sony / ATV this past July. "It was the right time, you know? I held off for as long as I could [so] i could build up enough leverage to get the deal that I wanted. It's a really nice tool to have [because] it opens up resources and opportunities that I can't open up fro myself. I've only just recently started to take a step back and realize that I get to do what I want. I actually started to smell the roses a little bit." Though Prezident Jeff now has the opportunity to split his time between Toronto and other cities abroad, at his core, Toronto will always be home. "There's something about passing by that basketball court or seeing my elementary school that just gives this feeling of returning to my childhood," he says. "I don't know how that influenced my sound, but that sense of always feeling like you're home plays some role in why I sound the way I do. This is the stuff I don't take for granted."